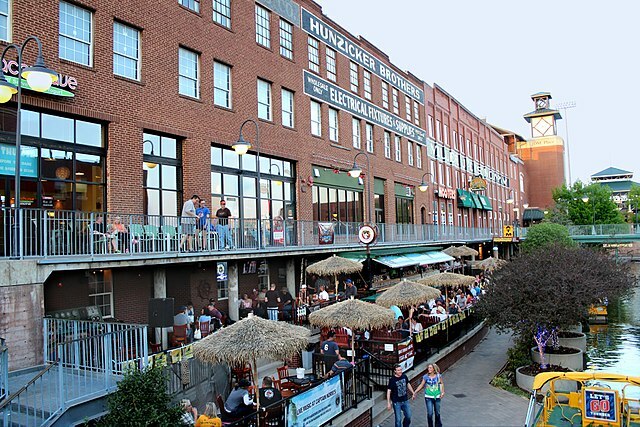 Not far from all the hotels of Oklahoma City's Downtown area is the entertainment district known as Bricktown. This area was originally a warehouse district that eventually fell into disrepair. But in recent years it has been revived as a popular spot with great restaurants, live entertainment, and even a canal where you can take a boat ride. While Bricktown is now a popular destination for both Oklahoma City residents and tourists, it wasn't always this way. The area was originally developed as a warehouse district for businesses operating in and around the downtown OKC area. Bricktown is the historic crossroads of commerce in Oklahoma City. Four railroad companies, the Santa Fe, Rock Island, the Frisco and the Katy, chugged into Oklahoma City spurring economic development in the area. The railroad shipped cotton, wheat, fruit, corn, cattle, horses and mules across the nation, helping to boost the farming industry in the state. After the discovery of the Oklahoma City Field, in 1928, oil was added to the list of export.Besides shipping out Oklahoma goods the rails also brought in goods which helped our farmers like farm equipment and machinery. Cars were added to the import list especially after Henry Ford opened his assembly plant in Oklahoma City. The days of the big industrial warehouses is gone. Now you can spend hours wandering around the shops and along the canal. You can even catch an Oklahoma City Dodgers baseball game at the stadium. One of the most popular reasons to visit this area is the large number of restaurants and bars in this relatively small area. Whether you're looking for family-oriented entertainment, or something more adult, you've got lots of options. Michael Murphey's is a great spot if you enjoy live music. Here you'll find a combination of a dueling piano bar and a comedy club. The music is chosen by guests, and the performances are top notch. All this is combined with a fun atmosphere that makes any night out here memorable. Mickey Mantle's steakhouse is THE place to get a great steak in the Bricktown area. Named after one of Oklahoma's most famous residents and one of Major League Baseball's all-time greats Mickey Mantle's knows steaks. And they have a wide variety of other options for those who aren't looking for red meat. You might not expect to find a canal running through Downtown Oklahoma City, but this is a great way to see the area. The Bricktown Water Taxi will take you on a slow cruise along the entire length of the canal. This is a great trip for kids as they can get a birds eye view of all the action along the canal. Tickets to the taxi run $11 for adults and $8.50 for kids from 6-12 (kids 5 and under are only $3.50). They are good for an entire day and you can hop on and off the taxi as many times as you like throughout the course of the day. The Chickasaw Bricktown Ballpark is located in the heart of this area. Here you can catch an Oklahoma City Dodgers game. This is a great activity for adults and children alike. The stadium is literally just a couple minutes walk from all of the great restaurants and activities of this area. The baseball season runs from early April through early October. For tickets, you can visit the OKC Dodgers website.